Hosting a course in conjunction with the International Association for Identification and TRITECHFORENSICS Training can be a terrific experience. Our students speak highly of their experiences, and we're sure your co-workers would enjoy the opportunity to advance their careers and learn new skills. We have innovative, hands-on learning opportunities taught by experienced instructors - courses you will want to bring to your area. Interested in hosting one of our many courses - or designing a course for your agency based on your individual needs? Visit our hosting page here, and then give us a call at (800) 438-7884 ext. 7800 or email our director, Phil Sanfilippo, here. 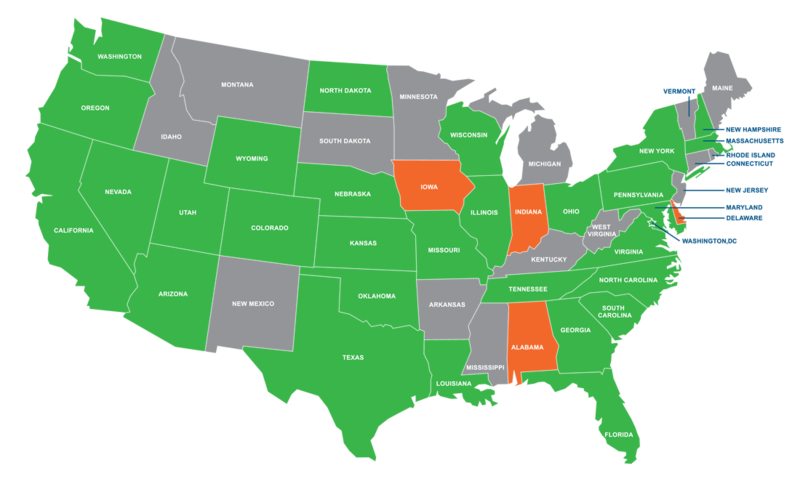 MAP KEY: The states in green represent course hosting states; the states in orange represent scheduled course host states; yellow represents pending course hosting state(s); and gray represents states currently seeking a host agency.